Devon Vinyl Floor Specialists R and S carpets are based in Honiton Devon and have a wide range of flooring types for supply and installation. R and S Carpets outline the advantages and disadvantages of Vinyl Flooring and installation the flooring type correctly. 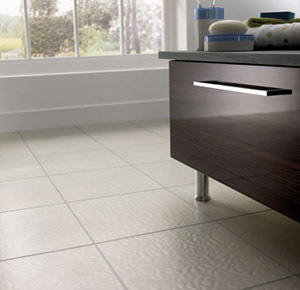 Vinyl Flooring Advantages and Disadvantages. Vinyl flooring has a number of advantages, which is why it has become increasing more popular as a flooring type in the home. Vinyl is very durable, comfortable underfoot, stain resistant and easy to maintain. Vinyl is available in a wide range of colours, patterns and even realistic replications of other flooring materials. Vinyl Flooring is particularly ideal for active families and those with pets, as well as being a good choice for many commercial settings. Vinyl comes in two forms: sheet and tile, each form inevitably has it own pros and cons. Vinyl sheet's popularity generates mainly from its adaptability for use in any part of the home, ranging from high traffic areas such as hallways and family rooms to wet areas such as kitchens and bathrooms. It is also a very popular choice for laundry rooms and cellars / basements. However Vinyl does not suit stairs, as it is designed only for flat, level surfaces. As with everything in life, you get what you pay for. Vinyl sheet flooring is expected to last 20-30 years if it is of good quality and properly installed and cared for. At the low end vinyl is relitively thin with a shallow wear layer on top of a vinyl or felt baking. A pattern is printed on its surface, The top layer is clear vinyl. It may seem brittle or stiff and could be subject to breaking or tearing. Its life expectancy is relatively short—usually less than ten years depending on the amount of traffic. However higher quality vinyl sheet flooring usually has colour throughout, not just printed on. The wear layer is therefore much thicker and may last up to 30 years depending on the manufacturer. It is scuff resistant, and can take a lot more abuse. Vinyl sheet is not one of the more DIY-friendly floors. The biggest problem is cutting the vinyl sheet to the correct size, and cutting around awkward shapes, e.g. the basin and toilet in a bathroom. Sheet vinyl is also very heavy and extremely bulky to work with. For this reason it is better to use a professional to install the flooring. In all cases, the subfloor that the vinyl is to be installed on to must be flat and dry and most of all smooth. If not, an embossing leveler may need to be used to smooth over textured surfaces, patch irregularities or fill in grooves. If there are any irregularities on the subfloor the vinyl will crack and tear over time. > How are laminate floors made?